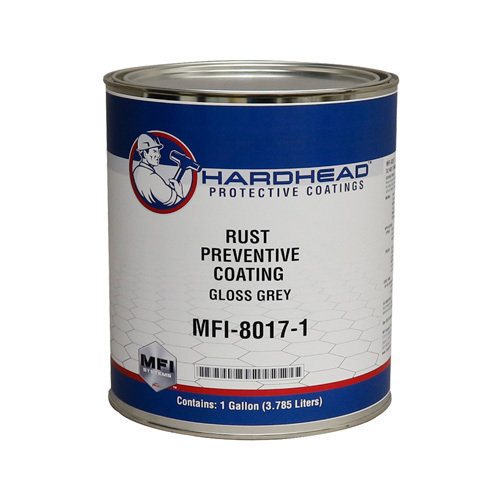 Rust Preventive Coating is a high solids, rust preventive coating designed to stop corrosion. This single component coating protects the surface from water, salt, chemicals and other corrosive contaminants. Rust Preventive Coating can be applied over properly prepared rust and dries to a flexible, non-porous surface that will not crack, chip, flake or peel. For applications exposed to UV light, it must be top-coated with an industrial top-coat. It is available in Gloss Black (MFI-8015) and Gloss Grey (MFI-8017). V.O.C. compliant in North America. Note: DO NOT SHAKE, stir thoroughly. Make sure product is at room temperature (72°F/22°F) before mixing. Do not return unused product back to can after use. Before closing container, apply a sheet of plastic wrap over can and attach lid. Coating will adhere lid to can if plastic is not applied. Spray: Apply 2-4 medium wet coats, while maintaining a gun distance of 12-14 inches. Allow 3 to 8 hours between coats depending on temperature and humidity. Each coat should be dry to touch with no tackiness before applying next coat. Roll-on: Apply thin, even coats using a nylon brush until desired coverage is achieved. Allow 3 to 8 hours between coats depending on temperature and humidity. Each coat should be dry to touch with no tackiness before applying next coat. Note: Rust Preventive Coating should not be applied when temperatures are below (50°F/10°C). The coating will have a tendency to bubble while curing when applied to heavily.